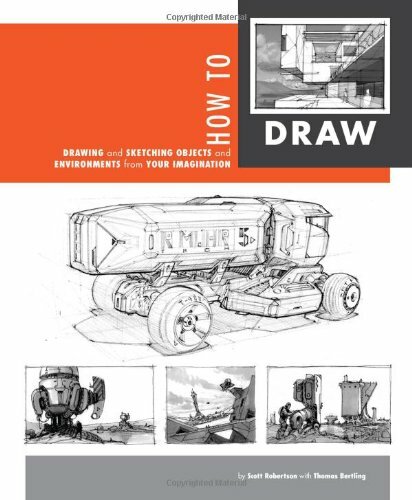 Concept designer and educator Scott Robertson (facebook | blog) has finally come up with his own book on how to draw, after teaching that to students for years. It's wonderful to finally have a book from him that we can learn from directly. This is a book for artists, architects and designers. The focus of the book is on perspective, and learning to draw from imagination. There are a lot of step by step instructions. Just copy them and the lesson points will sink in as you practice. The information is technical, but explained concisely. There are even videos online that goes through the main lesson points again for even more clarity. Perspective fundamentals are covered comprehensively, and subsequent chapters build on that knowledge to draw subjects of different form, environments, vehicles and aircrafts. You'll learn stuff like the usual 1-2-3 point perspectives, vanishing points, and also additional bits on cutaways, exploded views, ultra wide angles and more. There are lots of drawing tips. Compared to other perspective books, examples here are more challenging and stylish, such as cars, planes. curved bodies, instead of the usual houses, railway tracks vanishing to a point. There are plenty of illustrated examples. One part I like is where he shows off drawing as if they were taken from camera lens at different focal length. The difference in effect is quite stunning and can make a drawing look either dull or dynamic. Throughout the book, he emphasises on using grids and you'll be able to see immediate effects on how that affects the look of your drawing. There's nothing on drawing shadows though. But if you look at his illustrated examples, you'll see that even without shadows, you can make out the form and shapes of the objects perfectly. The last section briefly covers several sketching styles and mediums. You can experiment with different styles to suit yourself or the drawing. Here's the list of chapters included to give you an idea what to expect. By the way, he is also the founder of Design Studio Press and has overseen the publication of many DSP artbooks. Some of those artbooks are actually student projects and you can see what's actually possible when you master the fundamentals taught in this book. Mine's the paperback edition and the binding seems good enough. There's also the hardcover edition available. This is a highly recommended indispensable drawing guide. Thanks for the review Parka.